This don't have any effect. So we have to change scale part after part. Then, if this operation is not possible on an assembly, strange to see this option is available in assembly mode. Is there any manner to do this ? Don't use that scale. It will only work part by part. You may be able to use a UNITS change to accomplish this. 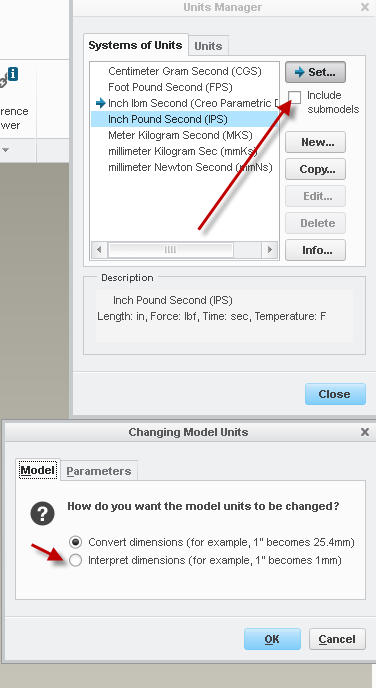 Go to file, prepare, model properties and adjust the units, if you can set the units change to accommodate your needed scale. First unit change would be to "interpret" the dimensions (1" becomes 1.5 units). I just don't know if you can make it work for any scale factor or if it has to be only a real units change, which wouldn't work for you. I know it's not a good explanation but you might want to experiment with it to see if you can get something to work. The option in the assembly would control dimensions created at the assembly level such as offset datums, assembly constraints, and assembly cuts. I can manage scales as I wanted according to your explanations. However, there are 2 steps for doing this. 2 In System of units : creating a custum SU with the special unit I've created. Using Creo 3, I'm not getting the option to go 1:1 with submodels checked. Since I'm working with an assembly of several hundred parts I'd rather not scale them individually! Any new information to share with the masses? Are any of your parts locked (PDMLink) or otherwise not modifiable? The include sub-models would need to be able to modify each and every part in the assembly. If there are any parts locked (using pdmlink or otherwise), you can't scale using the "include sub-models"
I cannot find anything that has been locked in the assembly. In order to work around the issue I have re-imported the Step file as geometry-only and was able to get the sizing corrected. However, I do still find it frustrating how difficult dealing with imported data is in Creo. Good that you found a solution. Not sure what "geometry only" means for an import. Poor memory on what the screen said from me... See attachment. Also, I imported it as a part, instead of an assembly.